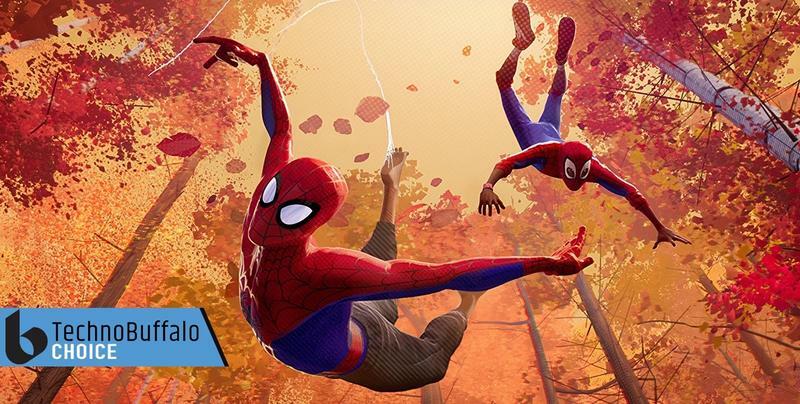 If you stayed through the credits of Spider-Man: Into the Spider-Verse, then you'd have seen a very peculiar post-credits scene. No, we're not talking about the one dedicated to the late, great Stan Lee, though that was beautiful. We're talking about the one that featured a fan-favorite character, which was both a nod to the future and a callback to Spider-Man's past. Here's a full breakdown of what happens. In the post-credits scene, audiences are taken well into the future to Nueva York, where we're introduced to Miguel O'Hara, otherwise known as Spider-Man 2099 (voiced by Oscar Isaac). There, we see Miguel talking to his holographic assistant Lyla (LYrate Lifeform Approximation), who is voiced by Greta Lee. Lee then gives O'Hara a bracelet that allows him to easily travel through the multi-verse. If you're unfamiliar with O'Hara, he lives in a dystopian future, where mega-corporations like Alchemax (that place where Peter and Miles steal the computer) dominate the world. At one point, O'Hara actually works for Alchemax, where he's tasked with creating super soldiers based on Spider-Man. Eventually, an experiment gone wrong fuses O'Hara's DNA with that of a spider, giving him enhanced senses and abilities. But his abilities aren't quite like that of Peter Parker. O'Hara's version give him fangs that can inject bad guys with venom, while he utilizes organic webs, rather than using a mechanical shooter. He also is unable to stick to walls, instead latching to them using talons on his hands and feet. When O'Hara uses the multi-verse device to travel through time, he decides to go all the way back to 1967, where he winds up in the hilariously bad Spider-Man cartoon. It's here that Spider-Man 2099 runs into Peter Parker, and the two enact the iconic pointing meme. 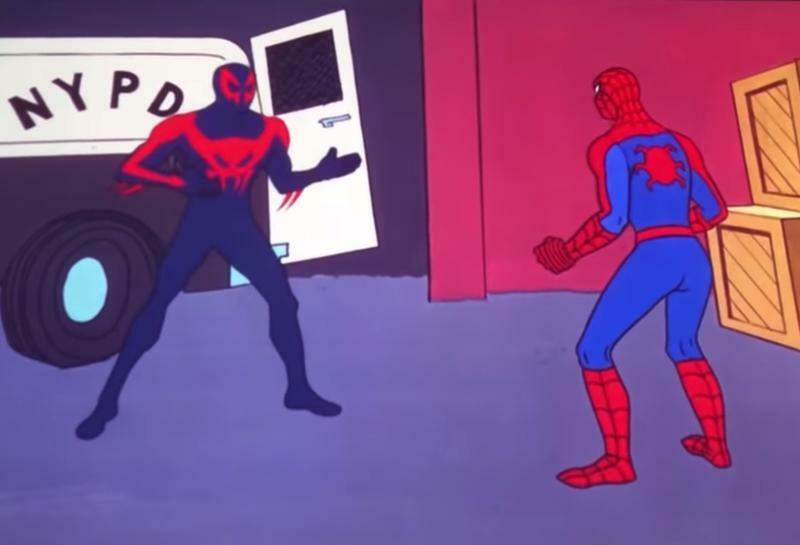 In the episode the meme takes place—titled Double Identity—a villain named Charles Cameo attempts to assume the identity of Spider-Man. When both Spider-Men confront each other during a robbery, they start accusing each other of being imposters, confusing the authorities. "Hold on, we'll have a showdown to prove which of us is the real Spider-Man," Spider-Man says. The post-credits scene in Into the Spider-Verse doesn't unfold exactly like the cartoon did all those years ago. Instead, Spider-Man and Spider-Man 2099 argue over who started pointing at who first. "You're being very rude," Spider-Man 2099 shouts. The "episode" then abruptly ends, with seemingly no resolution to the infinite loop of pointing. At this point, it's unclear if Spider-Man 2099 will factor into a sequel for Into the Spider-Verse. The post-credits scene may have just been a fun tag that highlighted one of Spider-Man's most popular memes. Or, Spider-Man 2099 could play a role in the upcoming sequel for Into the Spider-Verse, which may feature plenty more dimension hopping. After all, the movie did end with Spider-Gwen visiting Miles again, suggested that it's pretty easy to jump between dimensions without Kingpin's Collider. Spider-Man: Into the Spider-Verse is in theaters now. You can read our review below. I didn't think it was possible, but it happened: Sony made a fantastic Spider-Man movie. Sony first teased Spider-Man: Into the Spider-Verse last December, an entire year before the movie was set to hit theaters. The animated flick was going to turn the Spider-Man movie lore on its head and bypass Peter Parker as its protagonist and instead focus on Miles Morales (Shameik Moore), a character first introduced to comics in 2011. A year later, the movie is hitting theaters and it is an utter triumph for not just animated movies, but for movies in general. In case you are unfamiliar with Miles Morales, the movies does a great job of filling audiences in: he is a half-African American, half-Puerto Rican teenager living in Brooklyn, New York, who is bitten by a radioactive spider and gains special abilities like Peter Parker. Where Into the Spider-Verse does things differently is when it brings multiple Spider-people into the fold, adding a dimension unlike anything we've ever seen in a comic book movie. Without getting into spoilers, I won't say how they come into being, but besides Miles, there are five additional Spider-people: Peter Parker (Jake Johnson), Spider-Woman (Hailee Steinfeld), Spider-Ham (John Mulaney), Spider-Man Noir (Nicholas Cage) and Peni Parker (Kamiko Glenn). Together they mentor young Miles to becoming the dynamic Spider-Man he is meant to be. They also team to battle Wilson Fisk and his group of baddies, which includes a gigantic Green Goblin and the menacing Prowler. But make no mistake, this is Miles' movie. The relationship between the Spider-people is the best part of the movie, partly because the voice acting is so great. There is a warmth that provides plenty of laughs, but also a strong foundation from which Miles can explore his struggles and fears of being Spider-Man. It's complicated being a superhero, but more so for a teenager. Helmed by a strong script from Phil Lord and Rodney Rothman, the multidimensional story directed by the trio of Bob Persichetti, Peter Ramsey and Rodney Rothman never becomes too convoluted. In fact, it opens up to levels few other superheroes have ever reached thanks in part due to the freedom animation brings. There's just some stuff live-action cannot replicate but in the limitless world of animation, the imagination can run wild and Into the Spider-Verse takes advantage of this. It uses a mix of classic 2D with 3D while sprinkling in stylized comic book inspired finishes for a visually striking movie. Seriously, you'll be left with oohs and ahs as you see Spider-Man swinging through the New York skyline in his makeshift costume and classic Jordans. I haven't come away thoroughly enthralled by a movie like this in a while. It felt fresh and new and like something I have never seen before. It left me wanting to see it again, which I'm definitely going to do. Though I'm a big fan of the original Tobey Maguire Spider-Man and Tom Holland's Spider-Man: Homecoming, Spider-Man: Into the Spider-Verse is easily the best Spider-Man movie I've ever seen.